Nintendo’s charming Pokémon Quest places you in the world of Tumblecube Island, where you’ll befriend Pokémon, decorate your base, and battle your way from shore to shore. While the game isn’t nearly as complex as the core Pokémon games, it’s still a fun little time-waster that gives you the opportunity to catch blocky versions of all of your favorite Generation One Pokémon. Pokémon Quest’s roster of available Pokémon includes all of the generation’s Legendary and Mythical Pokémon, which can be befriended by cooking special recipes using ingredients obtained much later in the game. 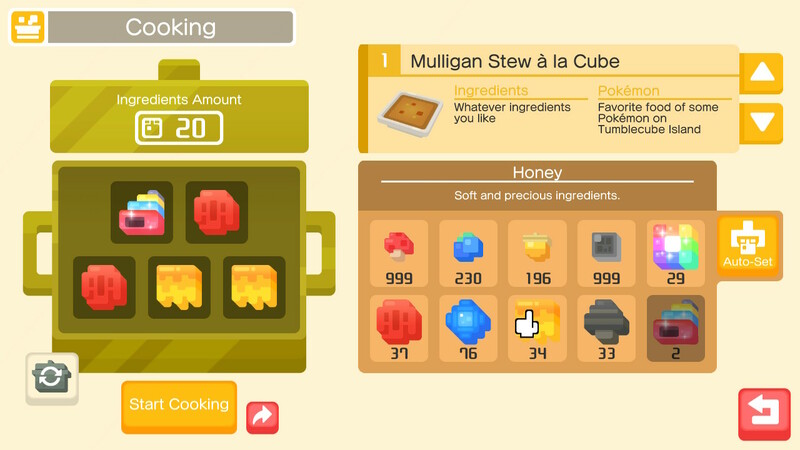 You can learn more about Pokémon Quest‘s cooking system in our helpful guide! 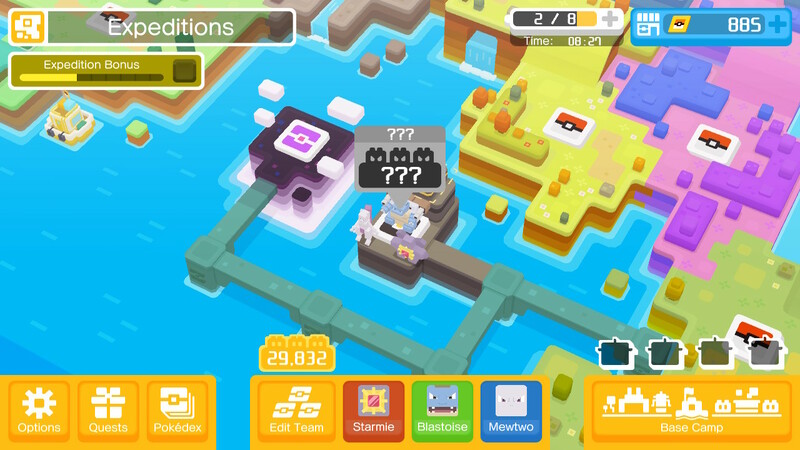 In Pokémon Quest, you can obtain the Legendary Pokémon Articuno, Zapdos, Moltres, and Mewtwo, as well as the Mythical Pokémon Mew. To attract these Pokémon to your camp, you’ll need to cook the recipe Ambrosia of Legends. By cooking the Ambrosia of Legends recipe, you get a chance to attract Legendary and Mythical Pokémon. You won’t be able to obtain the necessary material to unlock this recipe until you’re near the end of the game, as the required Mystical Shell won’t drop until you reach levels 12-1 and higher (on Happenstance Island, which we'll get to below). Once you have Mystical Shell, the recipes to attract the Pokémon are simple. Aside from the Mystical Shell, there aren’t any specific ingredients required to attract Legendary and Mythical Pokémon, so you can fill the empty ingredient slots with whatever you want. The quality of the dish will matter, but personal culinary skills are not required. The above recipe will always create a Special quality Ambrosia of Legends, which can attract any Legendary Pokemon. You can also use Rainbow Matter in place of any of the Precious ingredients, but do note that it is not required to attract Legendary or Mythical Pokémon. It’s important to make sure to use different types of Big ingredients in your ingredient slots. If you use, for example, Icy Rock in each of the remaining four slots, it will essentially overwrite your use of the Mystical Shell. Instead of creating the Ambrosia of Legends, you’ll instead craft a Blue Soda a la Cube and attract only normal Pokémon, wasting your Mystical Shell. This is where swapping in Rainbow Matter can come in handy. Contrary to popular belief, you do not need to use Mystical Shell in more than one ingredient slot. Any recipe crafted using Mystical Shell (at least 3, meaning one lower slot in the pot) and at least three slots filled with Precious quality ingredients (the big ones) will create the “Special” quality Ambrosia of Legends recipe. Do this and you will obtain at least one of any of the Legendary or Mythical Pokémon available in the game. It may be important to note that there are three different qualities of Ambrosia of Legends. The quality of the dish will determine which Pokémon are attracted. Articuno, Zapdos and Moltres can be attracted by cooking any quality Ambrosia of Legends, which includes Good, Very Good and Special. Mewtwo and Mew can only be attracted by cooking the recipe at Special quality. It’s extremely simple to ensure you are always crafting at Special quality. Always fill one ingredient slot with Mystical Shell and at least three slots with Precious quality ingredients, and you’ll craft a Special quality dish every time. It’s also worth noting that there’s no way to guarantee which Legendary bird you’ll attract. Sticking to Icy Rocks and Bluk Berries won't necessarily attract Articuno, for example. If you’re at the point in the game where you’re using Mystical Shell, you'll probably have more than enough Precious quality ingredients to ensure you’re crafting Special whenever you need to. There’s no reason to be stingy with those ingredients, as the Mystical Shells are the ones that are harder to come by. You can attract Legendary and Mystical Pokémon using any pot as long as you’re cooking the right recipe. You can complete your Pokédex using even the lowest tier pot, which requires only 3 of each ingredient per slot. Using higher level pots, along with Decorations, can also increase your chances of attracting more than one Legendary or Mythical Pokémon at the same time. All that said, keep in mind that using lower tier pots attract lower leveled Pokémon. If you use the Gold Cooking Pot, the trade off is that recipes will require significantly more ingredients, but you’ll attract Legendary and Mythical Pokémon that are level 70 or higher (possibly even maxed at level 100). Depending on your focus, you could use lower tier pots to attract lower leveled Pokémon, as ultimately their value is determined not by their level but their move slots, Bingo Bonuses, and Power Stone slots. It may not do you much good to use 20 Mystical Shells to attract a level 100 Mewtwo that has awful bonuses when you could instead use 18 Mystical Shells and attract (at least) six Legendary Pokémon that may be better equipped. Consider how much time you'd like to dedicate to farming Mystical Shells! At max level (100), a Pokémon attracted with a low quality pot will have roughly 5 percent lower stats than one attracted with the highest quality pot (Gold). This is essentially the opposite of how the mainstream Pokémon games work, in which it’s more beneficial to level a lower leveled Pokémon rather than catch a higher leveled version. 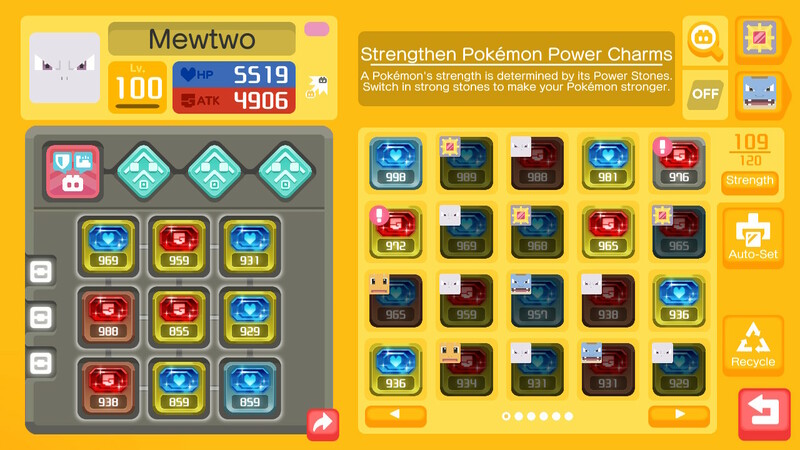 If you happen to attract a Pokémon with optimal Bingo Bonuses, move slots and Power Stone slots by using the lower leveled pots, remember these benefits typically outweigh the loss of base stats. 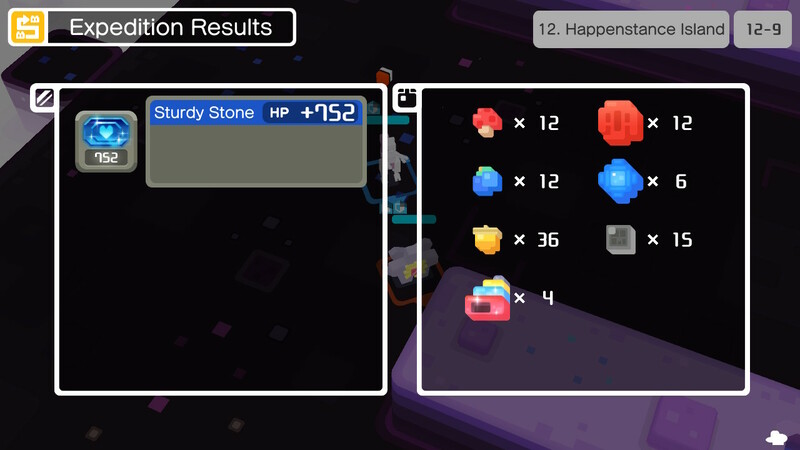 Mystical Shell can only be obtained once you reach Happenstance Island (Island #12), which unlocks after defeating the final boss and is essentially the “end game” of Pokémon Quest. Mystical Shells have a chance to drop like any other ingredient in these levels, though it’s worth noting that there are no Decorations that will increase the drop chance. The “best” level to farm for Mystical Shell is the highest you can manage to push through quickly. The higher levels have better chances to contain Legendary bosses, which can increase your chances of obtaining Mystical Shell, so you’ll want to farm levels 12-8 to 12-Boss assuming you can handle them. Be prepared for disappointment. You aren't guaranteed to receive any Mystical Shell drops regardless of which level you're farming, so expect to return home empty-handed more than a few times. Remember that even if you fail during an Expedition, you have the option to spend PM Tickets and keep your drops. If you’ve accumulated a decent quantity of Mystical Shells but couldn’t clear the level, it may be worth spending the PM Tickets so it isn't a total loss. Especially since you’ll get free PM Tickets every day.